Vita Sackville-West died 50 years ago this month. What was it about her unique style that inspires gardeners today? 'Gardening is surely an ideal profession for the woman who likes it. The work is not so heavy as to put too great a strain on her physical capacity; and in the more expert branches the possibilities and range of interest is really unlimited,” wrote writer and gardener Vita Sackville-West in The Women’s Land Army, published in 1944. For Sackville-West herself, who died 50 years ago this month at the age of 70, gardening was more than a profession. In her gardens at Long Barn and Sissinghurst Castle, both in Kent, she achieved a degree of aesthetic coherence which consistently eluded her in her fiction, with its tendency to melodrama and tempestuously heightened emotions. While her writing sought to imitate the human heart, in all its nuances and strangeness, in her gardening she captured a simpler, more straightforward love: the countrywoman’s love of the land and its husbandry, the artist’s love of form and colour. Today Vita’s name has become a kind of shorthand when applied to garden design. She once defined her approach as “profusion, even extravagance and exuberance, within confines of the utmost linear severity”, and her style is characterised by abundant planting enhanced by self-seeding, a careful shading and blending of colours and a passion for roses, traits which later found echoes in the work of Rosemary Verey, among others. Self-taught, experimental, romantic but also ruthless in her approach, she was the ultimate amateur genius. Her gardening appears quintessentially “English”, one reason for Vita’s continuing international renown, particularly among American gardeners. It is not a modern vision, but as anyone who has read Vita’s gardening journalism will know, her thirsty relish for plants, for new discoveries and fresh introductions, would have imposed a degree of modernity on any garden she created. For Vita, writing and gardening arose from the same impulse, irresistible in both cases, an unstoppable urge. “My garden all is overblown with roses,/ My spirit all is overblown with rhyme,” she wrote in a poem published in 1921. If literary scholars deny her the status of great novelist or great poet, they cannot deny the immensity of the wellsprings of creative inspiration which seldom failed her. Writing, like gardening, was a passion Vita cherished with the certainty of a vocation: her facility was enormous and never stalled. Over time the twin aspects of her artistry became increasingly entwined. In July 1907, the 15-year-old Vita recorded in her diary “the first money I have got through writing” — a prize of £1 for a competition set by Onlo oker to complete a limerick. Twenty-three years later, profits from her bestselling and still best-known novel The Edwardians paid for the damming of the stream which made the lake at Sissinghurst. A love of gardening permeates Vita’s poetry, most notably her two long poems, “The Land” and “The Garden”; it also shapes her fiction. In her 1934 novel The Dark Island, she resorted to horticultural metaphor: “Cristina, being something of a gardener, knew well enough that certain plants may appear to remain stationary for years while they are really making roots underground, only to break into surprising vigour overhead at a given moment.” For 15 years, from 1946 to 1961, famous by then as the co-creator with her husband Harold Nicolson of the garden at Sissinghurst, Vita was a professional garden writer. Every Sunday morning, she sat down to write a column for the Observer. Plants for Vita were every bit as real as people: they had personalities, appealing and unappealing traits, physical attractions and elements of mystery. She once described a particularly exasperating member of her family as being “as floppy as an unstaked delphinium in a gale”. It was plants that she considered her own contribution to the garden at Sissinghurst — “the maximum informality in planting”. Her husband’s contribution, by contrast, was “the strictest formality of design”. For those millions of visitors who have travelled to Sissinghurst since the garden was first opened to the public on a single June weekend in 1938, Vita herself has become an archetype of the green-fingered aristocratic English chatelaine, “England’s rose queen”, as she was labelled by American journalists. The truth is less simple and not nearly so sweet. Her mother, Lady Sackville, described Vita as “a beautiful mask”: the surface concealed unexpected secrets — hopes, anxieties and fears that were less beautiful. As Virginia Woolf, the most famous of her lovers, described Vita, “all about her is savage, patrician”. In her gardening, as in her writing, she found a channel for those “savage” impulses which arose specifically in response to one aspect of aristocratic life — Vita’s inability as a girl to inherit her family home of Knole. Knole, that sprawling Tudor palace in the Kentish greensward, set in 26 acres of garden within parkland reminiscent of the backdrop of a tapestry, was Vita’s childhood home and, as she freely admitted, even to her husband, the great love of her life. The only child of the third Lord Sackville and his exotic, illegitimate, part-Spanish wife Victoria, Vita spent a lonely childhood dreaming of those swashbuckling Sackville ancestors, whose portraits lined Knole’s galleries, and whose glamorous history shaped her identity. Following her father’s death in 1928, Knole passed first to Vita’s uncle and afterwards her cousin. Her sense of exclusion from the house and those ancestral acres to which she felt connected as by “some sort of umbilical cord” was agonising. It never left her. Over and over again, her novels extol the special magic of genius loci, the spirit of a place. That place is invariably an inherited house and garden. At Sissinghurst, Vita ultimately recreated something of the spirit of Knole in miniature. But even so, Sissinghurst could never replace Knole in her heart. 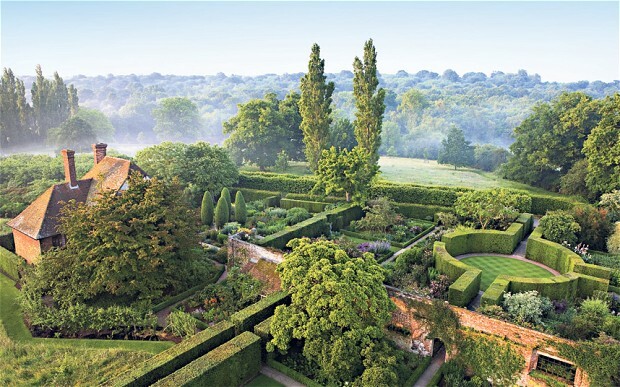 Gertrude Jekyll, William Robinson, Norah Lindsay, Edwin Lutyens and Lawrence Johnston of Hidcote all influenced Vita’s gardening: today her reputation is as great if not greater than theirs. Yet her perceived legacy — Sissinghurst-inspired white gardens across the globe — is only part of the story. So, too, is her misappropriation by gardening snobs as an arbiter of all things tasteful in the garden. Vita’s vision was too big, too romantic and above all too personal for conventional notions of good taste. Innovator and imitator, she created a garden at Sissinghurst that was both a statement of self-assertion and a means of rewriting her own history. At the end of her life, Vita described the process of writing fiction: “Ah, it is heavenly while it lasts. A sort of intoxication… You see suddenly, as in a finished picture, the entire shape and design of what you want to do. Happily, half a century after her death, the intoxicating effect of Vita’s gardening vision at Sissinghurst, albeit changed and modified by those who have succeeded her, lasts and lasts.